Nobody thinks they look good on their ID pictures! We always mess them up at the machine, but those are the pictures we use the most and we can't change them that often! Two good reasons to use the Pixum ID Photos! 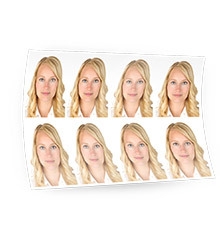 You can finally choose your favourite digital picture of you to create your ID Photos. Just upload it and we will turn it into 8 ID Photos ready to use for any of your papers! * (only 1x per order). Add voucher codes to your basket and save. In the event that a voucher has been used and a volume discount applies, we will always charge you the lowest price. Further details on using voucher codes can be found here. This item is usual ready for dispatch within 1 working days, plus postal delivery time. You will find detailed information on Pixum delivery here. Fantastic service came quickly and were just what I wanted, my son has his new passport now thanks to pixum! Met my satisfaction in both quality of photos & deiivery time. Excellent service. After trying to get a baby?s passport photo locally with no luck, used this service and the photos were perfect and a lot cheaper than the photo booths. Excellent value for money, quick delivery and great quality prints. Very convenient, I ordered photos for 3 passports which have arrived, no problems with the photos. Excellent service, as I'm disabled and confined to a wheelchair it is impossible for me to get into a passport photo booth, so all I had to do was have my grandson take my pic at home against a white background and send the photo to Pixum. Saved me a lot of time and inconvenience. Very professionally done and were accepted by HM Passport office. Promptly received the passport photos ordered. Professionally packaged, and high quality prints. Excellent value for money. Used them for passport pics. Perfect! Taken with iPhone and Alexa did the rest. Thanks very much! Product was perfect. Website was a little confusing placing the order but once I?d done it it was dispatched quickly and good quality. Excellent. Best in the world in my opinion. Thank you. Good quality, quick dispatch and delivery.I am very happy about the product. Great Service! Great price! Would definitely use again! Wonderful! What amazing service! My photos arrived this morning & I'm delighted with the results. We are giving you 25 free prints for your first order!